With only two and a half days in Barcelona planned, we tried to squeeze in as many of the major sites as possible. And, when you’re in Barcelona, a large number of the major sites are Gaudi structures. We promise that we saw more of Barcelona than Gaudi exhibits (and we’ll be sharing some of those experiences in upcoming posts), but since Gaudi architecture is so stunning and so important to Barcelona, we wanted to dedicate whole posts to them. Next up on our Gaudi tour: Casa Batllo. We paid a little bit extra and booked ourselves the Magic Nights tickets. 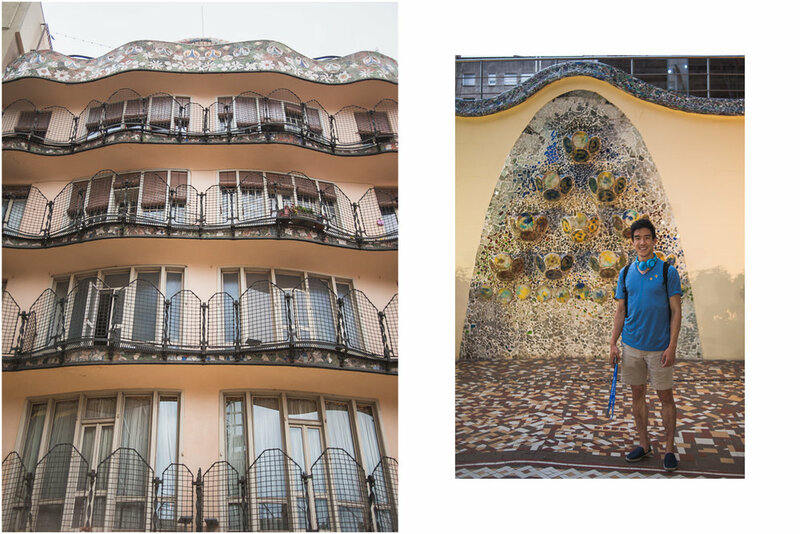 For 39 euro, you can access to the house starting at 7:30 p.m., receive a virtual tour, which was actually a cool use of AR, enjoy an evening concert on Casa Batllo’s gorgeous rooftop, and get two complimentary drinks (we went with the champagne). It was a unique and memorable experience that we highly recommend. The extra bells and whistles aside, we were blown away by the intricate architectural details within Casa Batllo. The doors, archways, columns, stairs, banisters, window frames, and basically every element of the house were ornately designed and customized. And, like in Park Guell, the tilework was incredible. Walking through the house, it felt like you were under the ocean, or looking out from within an ancient sea creature. But, officially, the house is known as “The House of Bones,” thanks to its skeletal qualities. It’s crazy to think that this house was commissioned by the Batllos, a middle class family known for their contributions to the textile industry. But our favorite part of the house, of course, was the rooftop. Its design replicates the shape of a dragon, with metallic, intricately-detailed tiles representing its scales. The view of Barcelona from the rooftop was incredible. Enjoying the music, sipping champagne, and feeling the cool evening breeze coming in from the ocean made it a festive night to remember.